I’ll be doing a few posts finding some meaning for your video marketing from some of the keynotes from INBOUND, the inbound marketing conference. I’ll be focusing on what the main takeaways were was and how you should apply it to your video marketing. 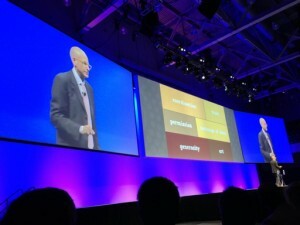 The opening keynote was from Seth Godin and he brought his ‘A’ game packed with a ton of quotable material. A lot of Seth’s talk focused on how we are moving from a time of mass marketing to an age of connections. He spoke about marketing to the fringe “Be on the edge to reach the people who care”. What he was pointing out here was that at one time you wanted to market to the mass. You wanted to pick the “normal” because it was the biggest audience. However over time, the fringe audiences have become larger and larger. That is a good thing because now your message can be more targeted and pertinent than ever before. His message was to craft very relevant and personal messages to the people who want to receive them, how they want to receive them. Have a point of view, be one of a kind. Whether these people are on Facebook or a small very specific user forum – show up with hyper relevant content to be a thought leader among those with similar views. Have you identified your target demographic and created a marketing persona of them? If yes, then good! You’re well on your way. Because when you are creating video content that speaks to that persona, you can get a much warmer response. There are so many variables that you need to consider who is watching as part of the production. As an example, let’s say you designed an app for 30 something first time moms, EVERY aspect of your video needs to speak to what is going on in their life. If the app is designed to help them – the script has to be written to speak to them. Maybe it’s a conversational but reassuring tone? Maybe it’s more of an authoritative tone? There’s a nuance of difference but it makes all the difference in how your audience will view the video. What about the voice over? Music? Every aspect of a videos production needs to be relatable and needs to speak directly to your audience, how they’d want to carry on a conversation. Don’t worry about the bigger picture audience, they don’t care. Don’t worry about “veteran” moms or grandmothers. If your app is designed for first time moms make your video specifically to trigger a response from them. Be targeted. Be relevant. Be remarkable. What about you? Have you created a marketing persona of your target demographic? It looks like you are doing great things! I also saw your award in WoMag awhile back. I’m still doing a bit of landscape design but a few years ago I went back to my education roots and started working with adolescents and young adults. In the last couple of years, I’ve been training and ramping up to open a new business to coach young people struggling with Attention Deficit Disorder, mostly due to the fact that my own son has struggled with it most of his life and I’ve helped him become successful enough that he is off to Brown next week. My website isn’t up and running yet, but I’m in the process of setting up a youtube channel, facebook and google pages as well. I will stay in touch as I would love to start producing my own videos but don’t yet have the capital. I need one where I talk to my audience on the website and I’d like to try an animated video for the kids. I kind of have two target markets – the primary is the parents who pay, but I also need to win over my clients so I’m trying to have a more hip component that will engage that audience without scaring off the parents. An interesting dilemma. I’ll stay in touch and hope all is well. Guess I’m not tech savvy enough to see that my comment would immediately post! Sorry! I didn’t mean to share this so publicly. At any rate I love animated video because it can encompass highly provocative and complex ideas by using both visual and auditory information. And, if it is offbeat and humorous enough, it sticks (even when not using stick figures!). With people who have learning differences, this can be a valuable source of information as well. As an artist I like to think I could add a creative component and do my own. I started to look at programs and apps but realize that, just as the internet allows us to reach the fringes, it also can create an instant turn-off if you don’t handle your promotional material well. It also reminds us that customer satisfaction is key. This is a great benefit to the customer. In addition, when working individually with a customer to provide a service, video can also give that customer a great deal of information about your style, values and approach. It saves time for everyone and qualifies the sale because if the customer wants to speak to you, you have already got their interest. Yes it posts immediately as I don’t like to moderate comments because I feel like when you do that it kind of kills the conversation on the blog. I love video and that’s why I’ve refocused my business on doing solely animated video as I think it is one of the most engaging marketing tools you can have for many of the reasons you mentioned. Hope you are well and talk to you soon!